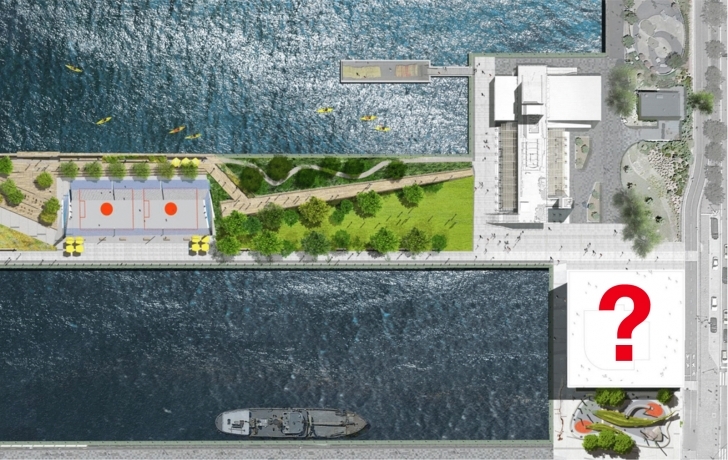 An ambitious plan for a river research and education center near Pier 26 in Tribeca remains in limbo as time grows short to raise the roughly $40 million needed to fund it. The Hudson River Park Trust’s deadline has been extended for finding a donor for the building, said Nicolette Witcher, the Hudson River Park Trust’s vice president for education and environment. The estuarium, as the building is commonly called, would be located upland between Piers 25 and 26. The deadline, originally set for the fall, has been extended to “late” fall, Witcher said. In April, Madelyn Wils, the Trust’s president, said $10 million of the $50 million needed for the estuarium had been raised. At the meeting this month, Witcher said “roughly” $40 million is still lacking. The playground is fully funded, and will have a slide and climbing structures that resemble two endangered species: the Atlantic sturgeon and its smaller cousin, the shortnose sturgeon. As now imagined, the two-story estuarium would house two kindergarten to 8th grade classrooms, three college postgraduate classrooms, and a technology exhibit. The River Project, which now operates at Pier 40 and was the river study center on the original Pier 26, would be in charge of the live exhibits and offer educational programs. Clarkson University would be the estuarium’s operator and hold some of its classes there. Plans for Pier 26 include soccer fields and lounge areas, an elevated walkway and protected tidal marsh, ecological study areas and a tree-lined lawn. Construction on the pier began in late September and is expect to take two years to complete.